On World Wetlands Day, 2nd February, the Irish Peatland Conservation Council (IPCC) are launching their 2019 Hop To It Frog Survey and this day also marks the beginning of Féile and Dúlra 2019, IPCC’s festival of nature supported by Kildare County Council. World Wetlands Day is a day of celebration aiming to raise the profile of the vital role of wetlands for people and our environment. Wetlands are home to many wonderful wild species of plant and animal and freshwater wetlands are home to Ireland’s only species of frog (Rana temporaria). But what’s so special about frogs? Well did you know frogs are fascinating? They can only see in black and white, they don’t drink as they can absorb water in through their skin, they can only live in freshwater and they can change colour depending on where they are living. Frogs are loved by gardeners as they feed on slugs and snails and they make a great source of prey for the grey heron and hedgehogs! Most important they are considered biological indicators to pollution as we know so much about them and understand their short lifecycle. Nuala Madigan, Education Officer with the Irish Peatland Conservation Council explains ‘understanding the frogs importance as a biological indicator to pollution, their populations must be monitored and since 1997 that is what the Hop To It Frog survey has being doing’. 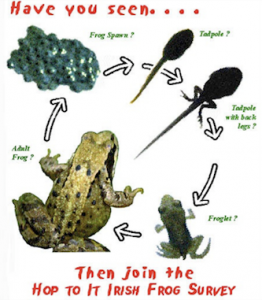 It is a citizen science initiative where members of the public can share with the Irish Peatland Conservation Council their sightings of frogspawn, tadpoles or adult frogs from anywhere in Ireland. It is easy to get involved fill in an online frog survey form or contact the Irish Peatland Conservation Council at the Bog of Allen Nature Centre on 045-860133 or bogs@ipcc.ie and a survey form can be posted to you. Frogs are fascinating and they are not the only captivating and fabulous wildlife to discover in your local wetland. Take time this year to discover and explore the wonderful wetlands in your local area and become a citizen scientist by joining the Hop To It Frog Survey. For Further information contact Nuala Madigan, Environmental Education Officer at the Bog of Allen Nature Centre on bogs@ipcc.ie or 045-860133. Féile an Dúlra is the Irish Peatland Conservation Council’s annual festival of nature supported by Kildare County Council under their Festival Grant Scheme. This entry was posted in News and tagged Bog of Allen Nature Centre, Bogs, citizen scientist, Events, Festival of Nature, Frogs, IPCC. Bookmark the permalink.